April 24th marked the beginning of the 1915 Armenian Genocide. Often referred to as Red Sunday, 101 years ago Ottoman officials rounded up hundreds of Armenian intellectuals in what was then Constantinople, now Istanbul. Most were ultimately killed, as the Ottoman Empire began systematically killing Armenians and taking their land. Modern-day Turkey denies there was any intent to destroy the Armenian people, saying it was civil war, not genocide, that killed as many as 1.5 million people. In marking the anniversary Sunday, the French Foreign Minister Jean-Marc Ayrault said publicly, “the first genocide of the 20th century should never be forgotten.” But Turkey is strategically important, and for the eighth time, President Barack Obama broke his campaign promise to Armenian Americans, failing again to officially use the word “genocide” with respect to the mass killings of Armenians. Los Angeles is home to more Armenians than any other place in the United States. On Sunday, tens of thousands rallied to observe Armenian Genocide Remembrance Day. FSRN’s Lena Nozizwe reports. Ninety-one year-old George Jorjorian says his parents never spoke about the Armenian Genocide, even though it decimated their families. 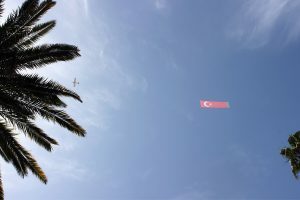 Yet speaking out is exactly what compelled the retired math teacher to take part in a rally in front of the Turkish Consulate in Los Angeles, California Sunday, along with an estimated 60,000 protesters. The consensus of historians is that starting in 1915, during the Ottoman empire, the Turks systematically killed as many as 1.5 million Armenians. In what Armenians call the Medz Yeghern, or the “Great Crime,” the Turks all but wiped out the minority population. The murders were carried out through immolations, mass drownings and forced death marches leaving hundreds of thousands of shattered families, a tragic history that Barbara Zimmerman, who is Jewish, knows well. Her own parents were Holocaust survivors who lost two children — twins. In a sea of regulation-sized red, blue and orange Armenian flags, Zimmerman brought along a small white and blue Israeli flag to the rally. It elicited warm responses from the mostly Armenian and Christian crowd. There is shared grief and anger. Close to 30 countries – and Pope Francis – have acknowledged the Armenian Genocide. But deniers persist, including Turkey. Similar messages were written in the sky above New York City last week, a full-page ad ran in the The Wall Street Journal, and a billboard went up recently in Boston, but was later removed. George Jorjorian, who came to the LA rally in honor of his parents, brushes deniers aside. Historians have long held that Armenia was the first Christian nation. And holding to the tenants of his faith, Jorjorian focuses ­on restoring the very place in Armenia which has been the root of so much grief.